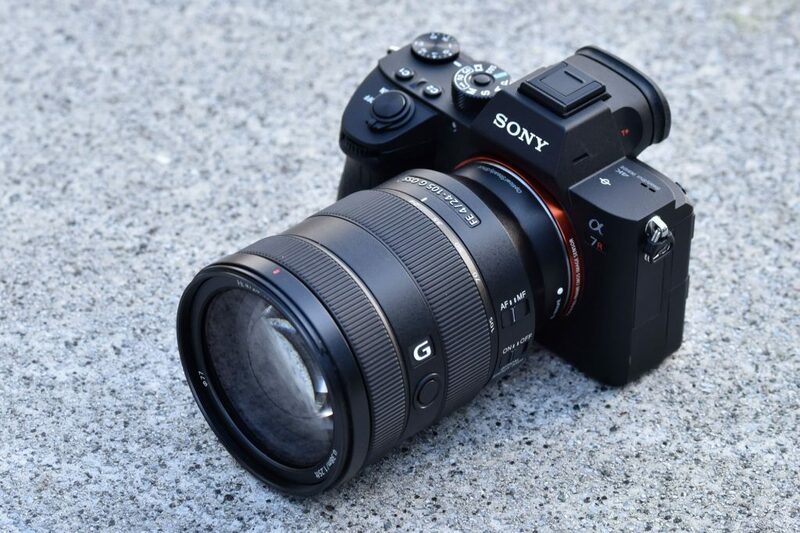 When Sony’s full-frame Alpha 7 mirrorless cameras first appeared a little over four years ago, there were legitimate concerns about the limited lens range available, and how quickly Sony might be able to build up a comprehensive system. But over the past few years the firm has accelerated the release of new optics, such that there are now 23 FE lenses in its line-up (not counting the specialist FE PZ 28-135mm f/4 G OSS video lens). This means that most of the key types are now available. For standard zooms, though, photographers have been missing one thing: a premium option with a maximum focal length longer than 70mm. Instead it’s been a choice between the relatively compact and affordable FE 24-70mm F4 ZA OSS for £880, or the stellar but huge and costly FE 24-70mm f/2.8 GM (£1900). 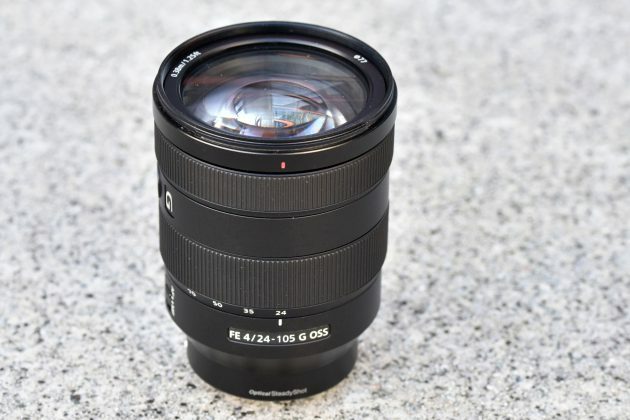 If you want a longer zoom range, the only option has been the £749 FE 24-240mm f/3.5-6.3 OSS, which like most extended-range superzooms is somewhat compromised optically. This new optic sits within Sony’s high-end G line-up, promising both excellent corner-to-corner sharpness and beautifully rendered background blur. It also features optical image stabilisation, along with dust and moisture resistant construction for outdoor use (Sony claims you can ‘shoot with confidence in light rain’). At 663g, it’s considerably lighter than either its Canon equivalent or the similar Sigma 24-105mm f/4 DG HSM Art, and a little smaller, too. The 17-element, 14-group optical formula incorporates four aspherical elements to maximize sharpness and reduce distortion, of which two are of the high-precision advanced aspherical type. In addition, three ED glass elements are employed to minimize chromatic aberration. Sony says that with precise control over spherical aberration, the lens should also deliver attractive bokeh. When you come to pick up the FE 24-105mm f/4, you’ll find that despite its relatively light weight, it feels reassuringly solidly built. While the textured barrel surface is clearly designed to mimic the finish of magnesium alloy, tell-tale mould lines and the lack of any coldness to the touch mark it out as plastic instead. There’s nothing wrong with this at all, as it helps keep the weight down with no evident compromise to robustness. A rubber ring around the mount maintains a seal with the camera body. 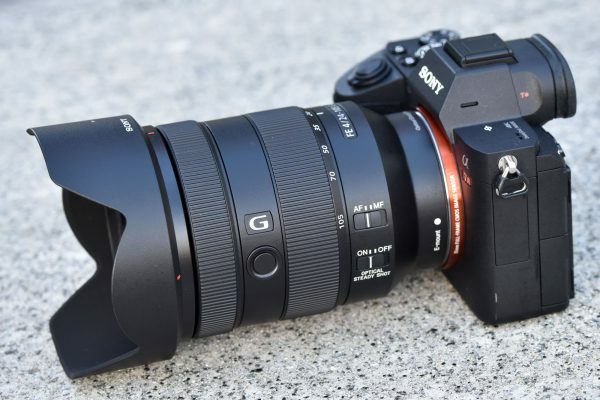 In terms of size, the 25-105mm f/4 sits partway between Sony’s two 24-70mm zooms, being larger than the relatively petite f/4 version but considerably less bulky than the f/2.8 G Master. Looking at pictures of it on the camera, you might wonder whether it’s a bit unbalanced, but I didn’t find this to be the case at all; it’s simply a case of supporting the lens with your left hand, just as best hand-holding practice demands. Crucially the combination is much smaller than lighter than even the most compact DSLR equivalent, such as the Canon EF 24-105mm f/4L IS II USM on the EOS 6D Mark II. Also on the side of the barrel is a large circular button that by default is used to temporarily interrupt AF. But it can be reconfigured to activate a variety of different functions in the camera’s menus, for instance depth of field preview or Sony’s useful Eye-AF function. When it comes to autofocus, the 24-105mm behaves much like Sony’s other recent FE zooms. It’s very fast and almost completely silent, thanks to the use of a Direct Drive Supersonic Motor. Uncorrected files show considerable distortion, which as usual is of the barrel type at wideangle, changing to pincushion across most of the zoom range. Sony can get away with this because it doesn’t have to provide a corrected viewfinder image, as is necessary for DSLRs. As a result, it doesn’t need to incorporate the same degree of resolution-sapping distortion correction into the optical design. Instead the distortion is corrected near-losslessly in software, resulting in excellent overall image quality; simply activate in-camera corrections and you don’t have to worry about it.